The proposed acquisition of Smithfield Foods by Shuanghui International is aimed to address China's rising pork consumption. China loves its pork and is willing to pay big for it. On Wednesday, Virginia-based Smithfield Foods (SFD), the world's largest processor of pork, announced that it was being bought by Chinese meat producer Shuanghui International for nearly $5 billion. It is the biggest announced acquisition of a U.S. company by a Chinese buyer. 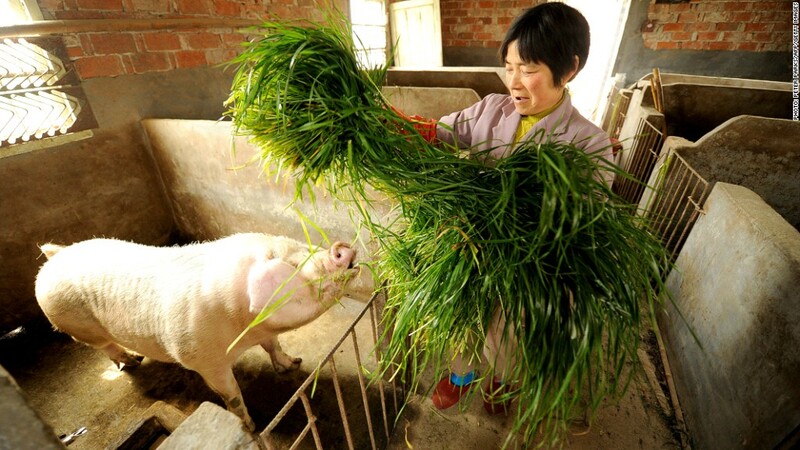 The deal makes sense: China's pork consumption has been steadily increasing. China is already the world's largest producer and consumer of pork. In China, per-capita pork consumption last year was 86 pounds, up from 70 pounds in 2002, said Mark Schultz, chief analyst with Minneapolis-based Northstar Commodity Investment. At the same time, Americans are eating less pork. Per-capita pork consumption in the U.S. was 58 pounds last year, down from 66 pounds in 2002. Given these trends, the deal to acquire Smithfield seems to be a strategic long-term move by Shuanghui, said Schultz. If pork consumption in China continues to rise, Chinese pork producers would have to look for alternative sources, he said. Shuanghui's chairman said in a statement that the deal aims to expand Smithfield's products into the Chinese market. "China already produces an adequate supply of 470 million hogs a year versus about 100 million hogs in the U.S.," said Schultz. "The question is how much more can you expand the production before you're limited by space and other issues." One such issue is risk of disease if pig farms are placed closer together to increase quantity, he said. China's pork industry recently faced controversy when a farm admitted to dumping dead, possibly diseased, pigs into a river. Shuanghui itself was in the spotlight in 2011 when an illegal additive was allegedly found in meats produced by a subsidiary of the company. Chinese companies of all kinds are also eyeing U.S. acquisitions for other reasons, including strengthening their credibility and competitiveness in their home market, said Thilo Hanemann, research director with Rhodium Group, which tracks all direct investment by Chinese companies in the United States. The Chinese market is growing much faster than the U.S. or global market, said Hanemann. Chinese companies want to become more competitive, but lack the management and technology expertise. By acquiring American companies, they get access to both. Early last year, China's Dalian Wanda bought American cinema chain AMC for $2.6 billion. "Movie theaters are a growing industry in China," said Hanemann. "That acquisition gave Wanda access to an established industry brand, and the technology and management expertise to help it grow the concept in China." By buying Smithfield, Shuanghui also gets more credibility with Chinese consumers, especially after its recent controversies, said Hanemann. Under terms of the deal, Shuanghui will acquire all outstanding shares of Smithfield (SFD), maker of popular packaged meats brands such as Eckrich, John Morrell and Farmland, for $34 a share in cash. That's a 31% premium to Smithfield's closing price of $25.97 on Tuesday. Once the deal is approved and completed, Smithfield will cease to be a publicly traded company, becoming a wholly owned independent subsidiary of Shuanghui International. Shuanghui said it will keep SmithField's current management team and all of the company's ongoing operations in place after the transaction. "It will be business as usual -- only better," Smithfield CEO C. Larry Pope said in a statement. "We do not anticipate any changes in how we do business operationally in the United States and throughout the world. With our shared expertise and leadership, we look forward to accelerating a global expansion strategy as part of Shuanghui." The deal, which is subject to regulatory and shareholder approval, is expected to close in the second half of 2013.